give a fig | Good golly…more cauli! I’ve been meaning to share the details of my Saturday night meal with you. Honestly, it was so yummy, it was all I could do to keep from eating the entire meal right out of the skillet. It took great restraint to scoop it into a proper bowl…and to take the time to fetch my camera for a quick photo. There’s no point in further preamble. 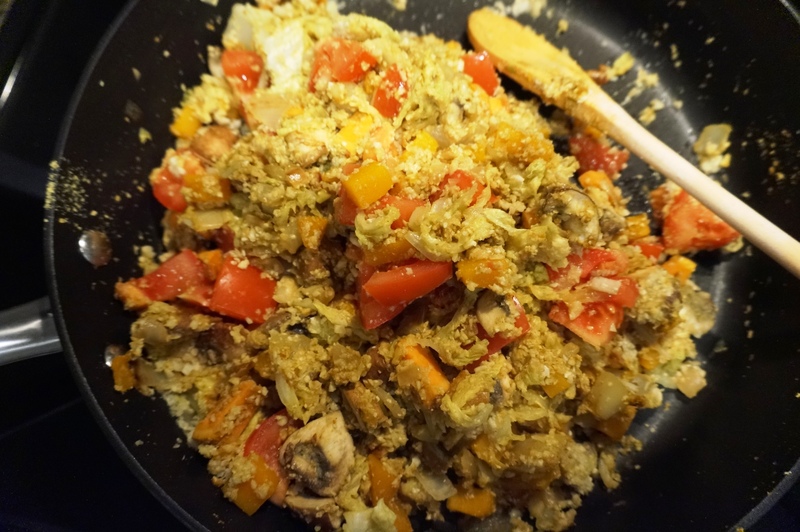 Suffice it to say that this is yet another riff on cauliflower rice. It can be eaten solo, or for some added protein, toss in beans or enjoy alongside a top-quality piece of organic chicken, beef or bison, or a slab of fish. A couple of poached eggs atop this delight works nicely too. Prepare all vegetables (chop, dice, etc. ), including transforming the cauliflower into ‘rice-like’ pieces using the S-blade of a food processor. Melt coconut oil in large skillet on medium-high heat. Add onion, butternut squash and sweet potato. Saute until soft (about 5 minutes). Add mushrooms. Saute 3-4 minutes. Add cabbage and garlic. Saute 3-4 minutes. Stir in cauliflower rice and keep on heat for a minute or 2 until warmed through. 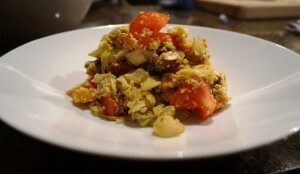 Remove from heat and add tomato chunks, nutritional yeast, salt and pepper to taste. Enjoy! 2 Responses to Good golly…more cauli! I’ve been on the lookout for a delicious cauliflower recipe. All the ones that promise so much seem to disappoint, but THIS looks and reads as amazing Julia. I’m going to give it a whirl (on the vitamix so that the Cauli gets rice like as advised! )and try it out one weekend.